EVs are zero-emission vehicles which comprise a huge piece of the plan to combat human-caused climate change (driving on sunshine, zero emissions). EVs provide a superior driving experience. EVs are safer than gasmobiles hands down. While this doesn’t apply to all EVs on the road today, the Tesla Model S and X prove upgrading to an electric drivetrain enables a step-change improvement in safety design. EVs further enable autonomous driving, which promises to bring even more improvements in passenger safety. EVs are cheaper to own and operate than similar vehicles. They are quiet! Driving becomes less stressful and an overall more enjoyable experience. Level 1 — Home charging @ 110v delivering ~1.1 kw speeds. Level 2 — Typical Level 2 chargers utilize the J1772 or Mennekes adapters for public and private chargers delivering up to 7.2 kw speeds, with most being 6.6 kw. Level 3 — Also known as “DC fast charging,” these CHAdeMO or SAE Combo chargers deliver charging speeds up to 50 kW in 30 minute sessions and have been designed to fill up current-gen EVs capable of “fast charging” in a relatively short amount of time. Level 4 — This new charging tier is defined by the Tesla Superchargers which offer consistent speeds up to 135 kW today with a near-term goal of 150 kW speeds. With all of these charging speeds, connectors, and locations, how do the different formats compare? 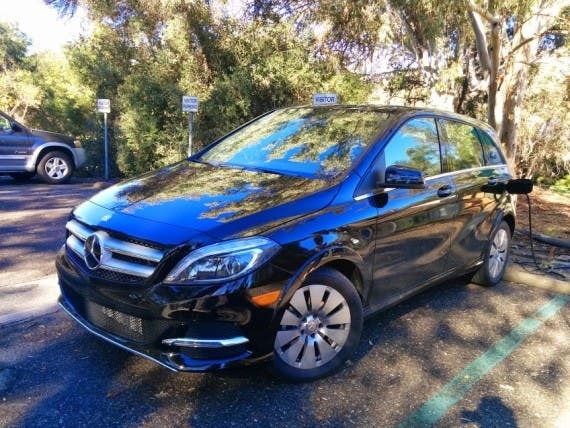 Having cut my teeth with EVs on a Mercedes B-Class Electric Drive, it was very clearly handicapped when utilized for long-distance driving… basically, anything over 70 miles. My wife’s family lives just under the maximum range of our B-Class from our house, so we really put the range to the test. It’s not just getting there… but charging at the destination, trying to go out to dinner when we get there, going on a hike the next day… things just get complicated quickly. We live in Southern California, which by most maps, sports dense coverage of public EV chargers. The flip side of that is that we are also home to 40+% of the country’s EVs. With Level 2 charging speeds requiring 4–5 hours to refill the 40 kWh battery of the B-Class, we quickly became constrained with where we travelled, when we were able to go out, which destinations we could hit, and the like. This resulted in most of our out-of-town trips (which we take once or twice each month) happening in our Toyota Prius. It was a great car but still burned gas, which I took issue with. Stepping up our game, I boldly went where not many dare to go — trading in the Prius for a second range-limited EV – the Nissan Leaf… but this time, made sure that our second EV supported fast charging. My thinking was that the addition of Level 3 “fast charging” would allow us sufficient flexibility to get down to the city, drop in for a quick fast charge, and have enough juice to get around. The reality was, unfortunately, not as glamorous as the visions I had dancing around in my head. We were able to get to where we wanted to go, fast charge, and get around town, but the sprinkling of DC fast chargers — with most being located at Nissan dealerships — made for the same frustration when looking for chargers. Nissan frequently ICEs fast-charging spots — as defined by the spot being blocked by an internal combustion vehicle. Other dealerships have fast-charging spots that are only accessible during business hours. And the story goes on…. While the DC fast charging network continues to grow, the Leaf simply didn’t meet our needs as our primary vehicle, specifically when being used for long-distance trips. Adding insult to injury, most DC fast charging stations bill $10 per session, which is more expensive per mile for fuel than the Prius was. Which brings me to the current chapter of my public charging experience — the Tesla Model S. After making basically a straight trade from the Prius to the Leaf, upgrading to the Tesla was not a popular decision in my household, but the promise of true long-range capability, a robust, free “Supercharging” network rolled up in a much more spacious luxury vehicle. After a few months of ownership and quite a few trips down to the city, does the promise of the Model S pan out? Is the blue-sky promise of Tesla in sync with the reality of ownership? The answer is, hands down, YES. We typically supercharge the night before or the day of travel just to top off the battery and head down to the city without having to worry about how much charge we have. I have confirmed that the navigation constantly monitors my battery state, destination, altitude, and distance, and accurately guides me either to my destination or the supercharger that I need to stop at. Most trips, we don’t even need to charge en route. On top of this, we can take advantage of conventional Level 2 charging to get a little extra juice if it’s convenient, free, or needed. The Tesla has truly transformed our primary car EV experience from one where we were indeed nervous about range, distance, getting a charging spot, or making it to our destination into an experience of calm, relaxing, tech-enabled driving. My only gripe with the car… at all… is the price. I’m cheap, I admit it… and the Model S was a stretch for our budget, but one I’m glad we made. It single-handedly enabled our transition to a completely gasoline-free family and, for that, I’m thankful. It took the stress of driving an EV to the city and made it beautiful. For these reasons, I’m absolutely thrilled about the Model 3… every piece of it, because with the Model 3 comes the promise of the Tesla experience that I’ve been fortunate enough to enjoy for hundreds of thousands of additional drivers each year, and for half the price. Yes, I’m concerned about congestion at Supercharging stations, but that’s a relatively small hurdle can be jumped when we get there.